Marketing agency VOCO Creative was having a hard time using email to communicate effectively with their internal team members as well as external clients. They worked out of two locations and had a number of clients in other cities. Plus, they were working on multiple projects simultaneously, which made it arduous to dig through emails to find important information. On top of that, vital work information such as meeting agendas, drafts, and mockups routinely got lost in the email system due to lack of structure and disorganization. Thus, email became an inefficient tool for project management for this firm. They realized that they had to find a quality project management software solution to output high-quality creative materials. VOCO Creative solved their problems by finding and implementing Wrike. What tools should creative companies look for in a project management system? We’ve compiled 10 important features that are included in Wrike creative project management software. Creative teams need to send and receive multiple revisions from clients. Therefore, they require a tool that allows effortless access to files and attachments at all times. They also need versioning — which provides a way to track the most recent versions for file attachments so your team does not end up handling different versions of the same file. Creative teams need a simple system to discuss work. Email is not suitable for this task as it is laborious and inefficient. 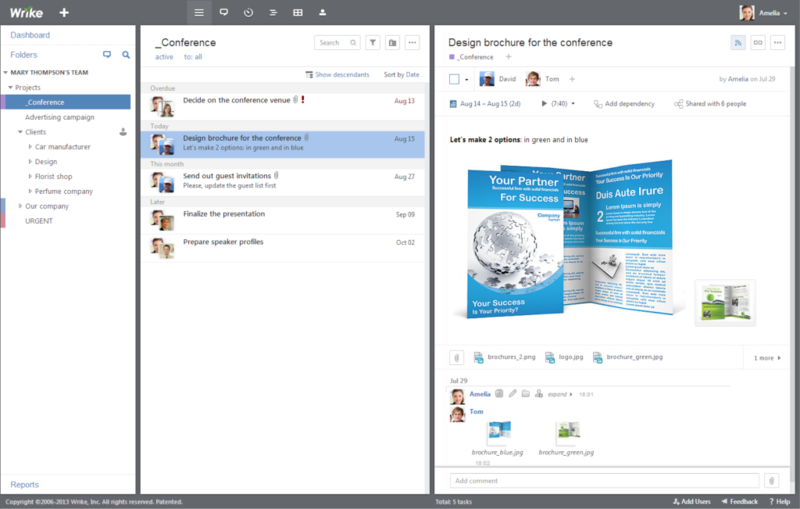 Wrike enables your team to have discussions in the same system where the actual work and the creative files reside. Team members can provide their feedback and views on the latest press release, a recently uploaded design mockup, or even ideas for a holiday party, and easily engage their colleagues to learn about their ideas. The software should allow multiple team members to access and contribute to files and documents simultaneously. It should ensure no one is locked out of a file when they need it for an urgent task. The system should also allow tasks to be shared effortlessly between team members. Most creative agencies bill by the hour, therefore they should be able to track billable hours. The software should come with a built-in timer so that you are able to easily track your team’s hours. The software should allow you to generate reports easily from real-time data. These can include timesheets as well as weekly productivity charts that provide data on your team’s output. Even lay users should be able to generate reports effortlessly without needing technical knowledge. To help you manage your schedule properly, the software should display how the different parts fit in the overall picture and where deadlines occur. This scheduling feature should be visual to provide a clear overview of the overall timeline, assigned tasks, and project milestones at a glance. In short, visual timelines aid creatives to visualize projects better. It is great to be able to view which team members or resources are available for a project. Therefore, the software should give everyone visibility into team members’ workloads as well as booked and available resources. In short, when workload multiplies, you require a system for resource management. The tool should provide drag-and-drop functionality to enable you to effortlessly create project folders and organize tasks. You should be able to link your tasks, move things around, and add tags to enable your team to view the complete context of their work. Almost half of email today is being viewed on mobile devices. Plus, the Bring Your Own Device (BYOD) trend is becoming more popular by the day. Therefore, the vendor should offer a dedicated mobile app and not just access via mobile browser. More and more employees are beginning to use their mobile devices for work purposes and you should help them with this liberated style of functioning. Each creative team works in its own unique way. Therefore, you should be able to customize the software for your way of working, instead of making the team adjust to the platform’s limitations. Basically, you require a solution with customizable statuses and workflows. Now that you know the top features offered by Wrike, let’s get on with how to use them effectively. You can also learn more about how Wrike helps you benefit from agile marketing in a separate post. Get the freedom to focus on your creativity with a solution that incorporates Wrike’s Extension for Adobe Creative Cloud and takes care of the administrative requirements of creative projects from request management to review and approval. Everything starts with an idea, a request that changes into the brief that drives your creative journey. Easily assign, schedule, and balance your team’s project management workload. Bring inspiration to life with the Adobe Creative Cloud Extension to read, reply, upload, add comments, and version files right inside your most used tools. Clear and actionable online feedback and proofing from everywhere you work (desktop or mobile) ensures only the right digital files make it out the door, while maintaining clear approval trails. Deliver your creative vision on time with custom workflows to enhance team satisfaction and reports to track performance. Creative companies leverage Wrike’s functionality to improve the quality of their assets across the board, make sure they are consistent, and to enhance their employees’ efficiency. With Wrike, they are able to manage and organize multiple jobs and projects concurrently, and complete them successfully. Subscribe to the Wrike free trial today to learn how your company can benefit from the creative project management software features detailed in this article.